DiploDog arrived in D.C. yesterday after her first flight and a couple of weeks relaxing with my parents. Only time time will tell how long her next flight will be. This first one was a relatively short jaunt. We were a bit confused by the fact that we had to pick her up in the regular passenger baggage claim area, but there she was waiting for us when we arrived, like a piece of Samsonite luggage. She seemed to handle the flight well and was no worse for wear. Once we signed the paperwork, there wasn’t anyone to cart her to our car, so we just attached her leash, I carried her crate and we walked back through the airport on the way to the parking garage like we owned the place and it was perfectly normal to be strolling through the airport with one’s dog. Here she is working it for a well deserved treat after her big day. We were a bit concerned about how she would make the transition to a one bedroom apartment after having a house with a yard, but so far, she has been a model dog. It is actually a bit disconcerting how well she has behaved. We keep waiting for the other shoe to drop. 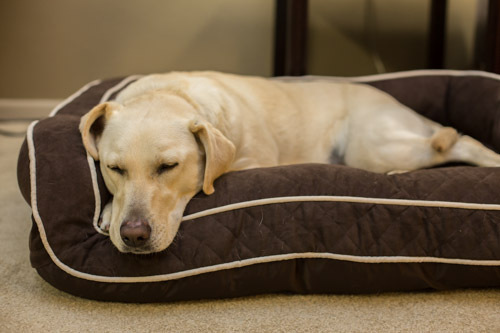 She had a new bed waiting for her when she arrived and she took to it immediately. 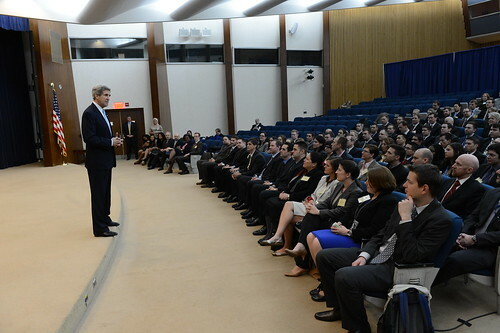 A photo from today of Secretary Kerry addressing DiploMom’s A-100 class from the State Department Flickr account. Check it out and see if you can spot her. Today was DiploMom’s first day and she had to catch the shuttle from the Oakwood to main State. We brought a few clothes for colder weather, but most items were packed in the UAB and are still on their way. Not that “winter” clothes from Houston really means much of anything. The locals have said this is likely the last blast of winter and things should start getting pretty nice soon. We’ll essentially get to enjoy two Springs, so the timing couldn’t get any better. It will be warming up just as we are getting settled in and ready to get out and explore the area. The father-in-law and I headed out from Houston at 5:15 am in a fully packed Yukon to make our way to Chattanooga, where we would spend or first and only night before arriving in Falls Church. I’m not a big fan of really long drives and I had some trepidation that the hours would pass in a very slow and painful manner, but it didn’t end being all that bad. I realized the key is having two drivers. If it had just been me, I imagine I would have felt like putting a bullet in my head half-way through Alabama, but not before giving a big Gig ’em as I passed through Tuscaloosa on behalf of Johnny Football. All told, it took us about 14 hours to get to Chattanooga. A big thanks to the brother-in-law who recommended staying at the Reed House, as it had a secured, valet parking garage, which meant I slept a lot better knowing the Yukon wouldn’t get broken into. 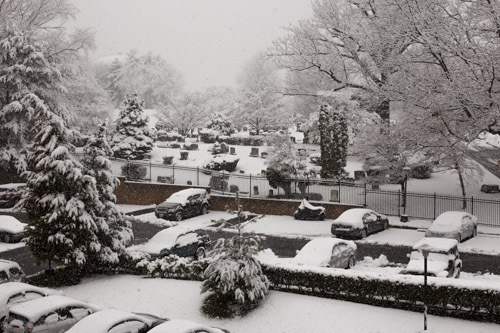 We left the next morning at around 5:45 am to make our way to Falls Church where we were converging with DiploMom, DiploTot and the mother-in-law, who were all arriving on a flight that afternoon. Thankfully the driving time this day was about 3 hours shorter and the scenery was just beautiful the entire way. I was thrilled to finally arrive in Falls Church and quite pleased that the long road trip went much more quickly than I had anticipated. DiploTot did great on her first flight too, which helped make this whole process even better. Some stats courtesy of the Garmin GPS: Total distance covered – 1,426 miles. Total time – 25:13, moving time 22 hours, stopped time 3:13. 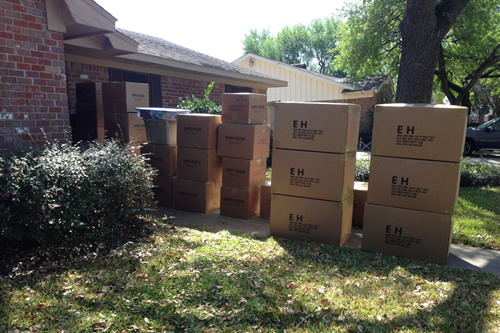 After a full day of packing boxes, the moving company came the next day to load all the boxes and furniture. DiploMom and I joked that this was our first “adult” move and it was a bit surreal to see all of our possessions being loaded into a huge 18 wheeler. The crew this day did an excellent job as well. 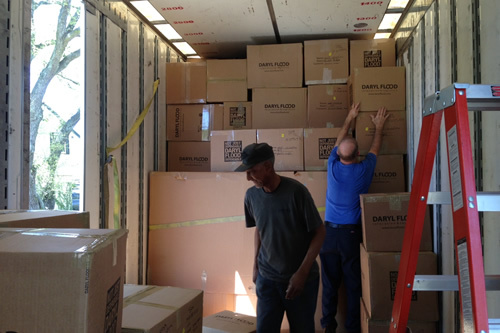 Everything was packed into the 18 wheeler like a huge Tetris puzzle. Of the entire length of the truck, our stuff took up probably no more than 25% of the space. By the time the driver reaches the storage facility in Maryland, the entire truck will be filled with other people’s stuff. This ended up being another full day and we’ve never felt so exhausted after not really having to do anything. I can’t imagine how this process would have gone if we would have had to box everything up and help disassemble and load all the furniture. 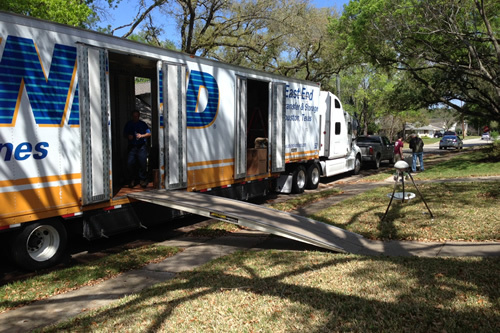 We were quite relieved to see the truck pulling away from our house considering that the move is all we have been thinking about for the past month. DiploMom and I spent a lot of time figuring out what we wanted to pack in our unaccompanied air baggage (UAB) shipment to the Oakwood. We had an entire bedroom in the house organized with the items that we wanted to be able to have with us in the in the apartment. We knew we had 600 lbs. that could be shipped, and while we knew that wasn’t a lot, it seemed like it would cover everything – never mind that we would also have the Yukon loaded up with items we needed to have immediately upon arrival. Well, the morning of our pack out finally arrived and we were running around at 5 am with pits in our stomachs, bemoaning the fact that we hadn’t gotten more finished before the big day. The packing crew arrived around 9:15 and we promptly asked them about the items we had sorted for our UAB shipment. They estimated that the items in the room were probably over 1,000 lbs., so needless to say, we then had to go into major filtering mode to get rid of the items that weren’t absolutely necessary. I had a nice set of clay poker chips – the kind in the fancy silver case that looks like it would be used to transport large amounts of cash around – which I had figured might be nice to have along. The case feels like it has two bricks inside. Well, that promptly had to go. The 3 seasons of Downton Abbey DVDs that might be nice to watch again, sorry. And on it went. We quickly learned that 600 lbs. fills up fast. We managed to get our key items packed and just had to leave out the “nice to have” items. Our packing crew from did an amazing job and helped to relive a lot of the stress surrounding watching all your possessions being packed away. Lesson learned – 600 lbs. really isn’t all that much and what one has set aside will inevitably weigh a lot more than initially thought.